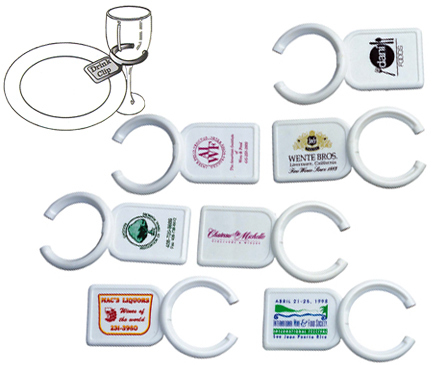 Our Drink Clips can be custom imprinted with any design you choose and are also available blank. Handy and fun, our Drink Clips hold any type of stemware to any sturdy plate. The Clips are perfect for cocktail parties or any event where guests mingle while holding their food and drink. 222 Drink Clip .99 .95 .89 .85 .80 1" x 1-3/8"
For additional information on Drink Clips or any of our other Bar, Nightclub, Restaurant, & Catering Supplies, please contact us at 1-800-233-0828.